Why is marine plastic pollution an important issue? KIDS for the BAY Instructor Cynthia DeLeon and third grade students from James Madison Elementary School in San Leandro set out to investigate this pressing question in the Storm Drain Rangers Program. Students learned that birds, fish, turtles, dolphins, sharks and even whales can be seriously harmed by plastic waste. More than 1,200 species of marine animals are impacted by plastic, through ingestion or entanglement—both of which can injure or even kill them. “A little bit of garbage that goes down a storm drain can harm a lot of creatures!” shared a student named Jayden. “We need to teach the rest of our school!” a student named Sunniya exclaimed. This school year, hundreds of KIDS for the BAY students have made the decision to become activists and environmental campaigners by spreading the knowledge that a little marine plastic pollution can cause a whole lot of harm through powerful, student-led Schoolwide Assemblies. So far this year, thirteen Assemblies have successfully reached entire school communities and educated thousands of additional students! 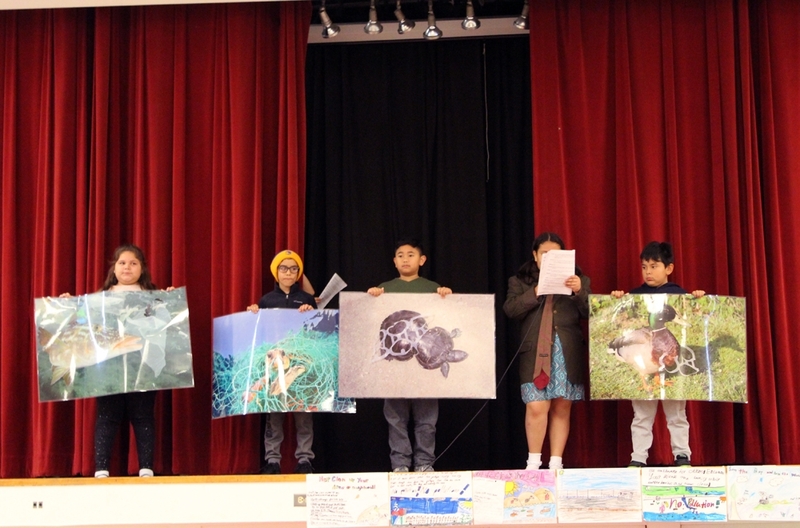 As KIDS for the BAY students at James Madison Elementary School planned their Schoolwide Assembly, they decided that the injured animals were the most powerful images to share with the audience because they illustrate the direct impact that littering and creating plastic waste has on the environment. “I care about cleaning up pollution because there are animals that think the trash is food! They could die from eating it!” shared Delver. 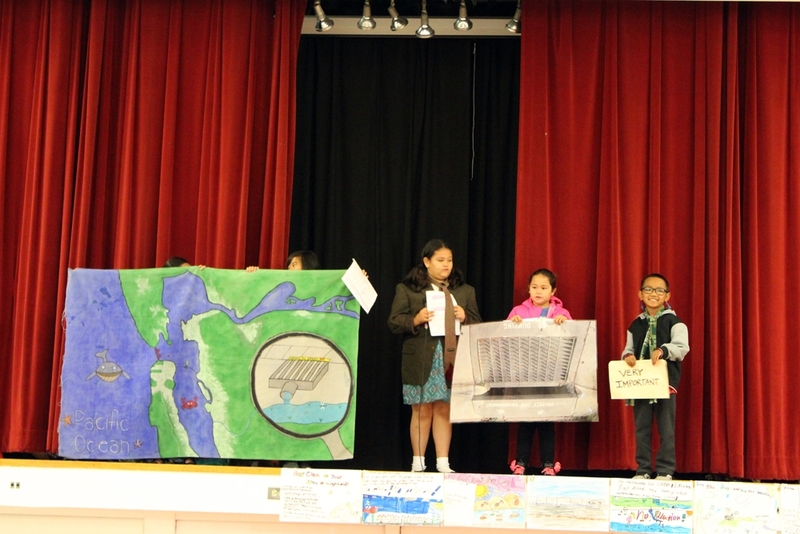 On the day of the Assembly, parents, teachers, and the entire school came to learn about ways we can all take action for a clean and healthy San Francisco Bay. Backstage, students were taking big breaths in and out to soothe their jitters. This was the first time that any of them had led an assembly! “Our students have been practicing their lines at home with their parents. They are becoming beacons of environmental action,” shared a third grade teacher named Ms. Emerson proudly. During the Assembly, the audience was shocked and surprised by the posters displaying different areas of our watershed littered with plastic and other types of pollution. Students in the audience gasped when they saw animals in trouble! The Assembly Leaders were excited to also share hope and solutions to pollution. “The thing to remember about the problem of marine plastic pollution is this: We can fix it! We can prevent it! The Five Rs are an empowering way to reduce, reuse, recycle, rot, and refuse trash,” shared the class. The audience was left with a feeling of hope and motivation to take care of our watershed and environment. As the third graders were packing up, a fifth grade student named Lucy came up to them and said, “Great job! We have to make less trash!” This was a powerful demonstration of the ripple effect that one small group of environmental activists can have throughout a community.